This is an activity that can be done by children of all ages and is a great illustration of Christ’s light shining through us. You will need: oil in small containers (I used vegetable oil), cotton swabs, paper, scissors, sticky-tack or clear tape, butcher paper (optional). You can prepare some shapes ahead of time, but children might like to cut the paper in the shape of their initial or of something that speaks of their own personality. 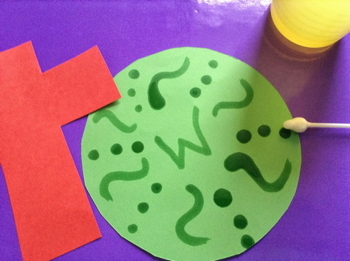 Use cotton swabs to “paint” oil onto the paper in whatever designs the children like. Children might want to write words about themselves or words about Jesus. 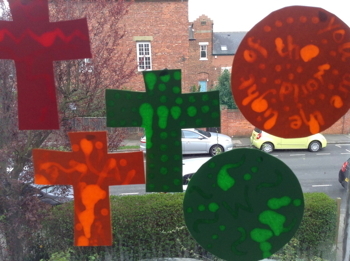 When the oil is dry, use sticky-tack or clear tape to attach the paper shapes to the window and let the light shine through the designs! Talk with the children about being light in the world. We let the light of Jesus shine through us by the things we do and say, just as the light shines through the patterns we made with the oil. 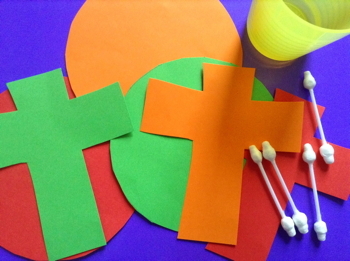 You might like to create a group design on butcher paper, where children draw or write actions or words they can use to show the light of Jesus that shines in them. As you hang it on the window, pray that other people will come to see that light!